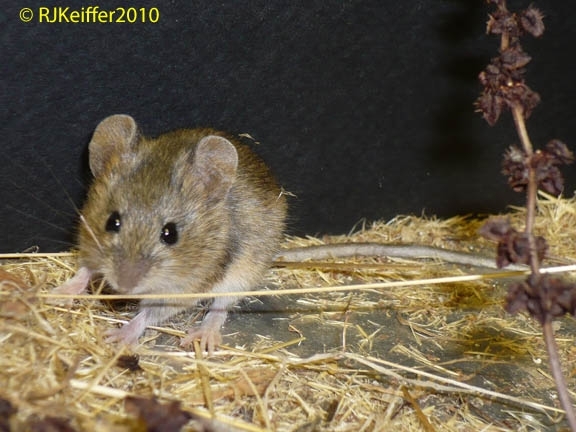 The Western Harvest Mouse (Reithrodontomys megalotis) is locally common throughout the western two-thirds of the of the United States (lower 48 states except for the high Rocky Mtns). This secretive rodent prefers open mesa habitats with thick grass and forb vegetation and a build-up of dense litter. At HREC they can be found in the long-ungrazed portions of the Center. Bristly fur, a long bi-colored tail, and whitish feet are all characteristics of this native species. Coast Live Oaks awaken to spring! HREC is blessed with location as the Center is located at a "hub" of climate zones and maritime influence and soil and elevation differences. As a result, HREC has over a dozen species of oaks that can be found on on the Center. 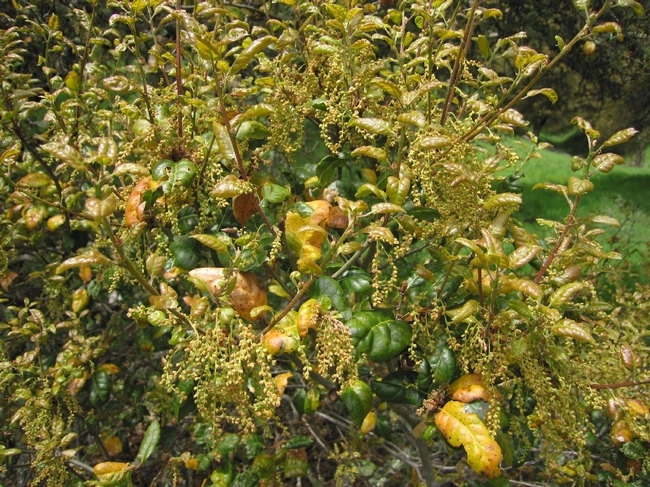 Here you see a Coast Live Oak (Quercus agrifolia) with fresh new leaves forming and catkins ready to bloom. Coast Live Oaks are only found at scattered locations at the lower elevations on the west side of the Center. 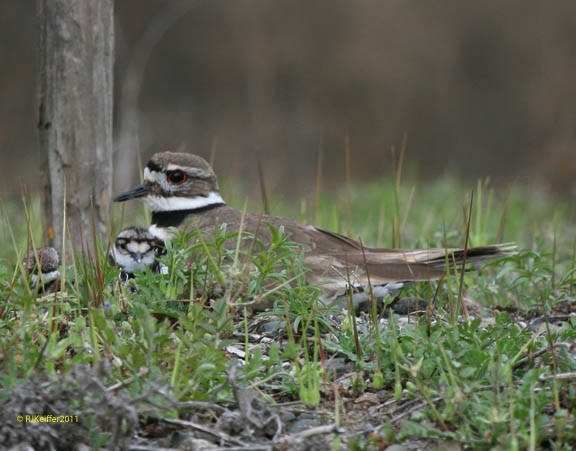 Springtime welcomes hatching Killdeer at HREC! Killdeer are the most common species of shorebird that utilize HREC, and the only shorebird species that nests here. This nest was placed by the parent killdeer in open gravel next to the HREC greenhouse, and was staked by HREC staff to prevent people from walking or driving over the nest. Two days ago the eggs hatched, and yesterday the "mom" led the precocial chicks, four of them, away from the nest site and down to Parson's Creek gravel bar. The Hopland Research & Extension Center is accessed by University Road which is a county road. 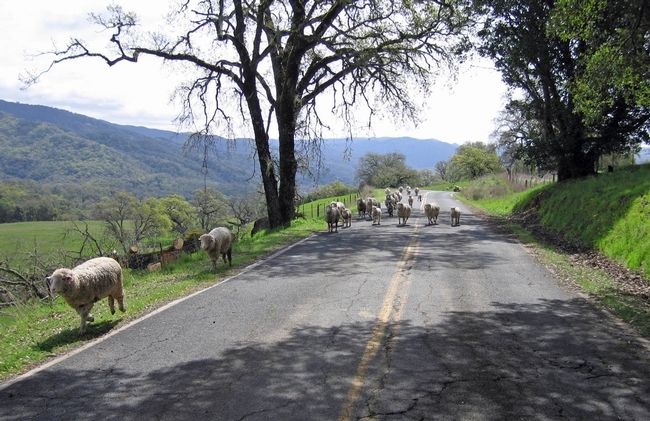 It is one of the last Mendocino County roads with a livestock "cattleguard" ( metal grate-like structure at ground level that prevents livestock from crossing without the need for a gate) maintained by the county. At times when HREC has sheep grazing in Vassar Pasture, visitors get the thrill of seeing sheep on the road ... literally! HREC Greenhouse retrofit makes it aphid-proof.  Beginning in 2010, a group of researchers began assessing an individual's risk of acquiring an infectious disease ("disease risk") and whether or not that risk can be determined by a handful of ecological traits of the host individual. They are also looking to see if other host species that are potential sources of infection play a role ("community context"). 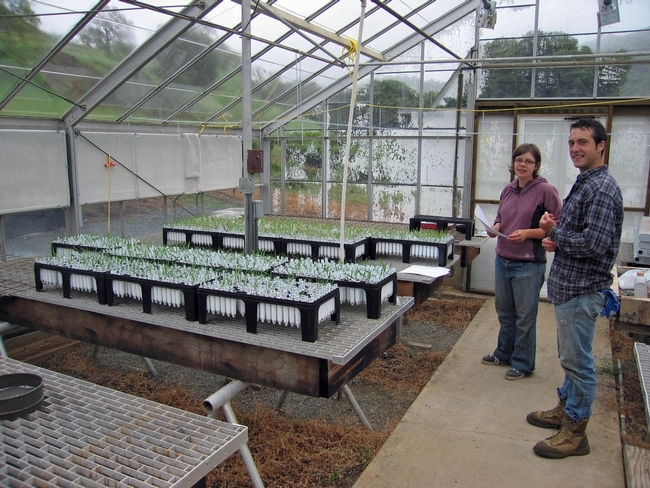 The experiments utilize aphids and grasses and a certain grass-specific virus as the model. The HREC greenhouse has been retrofitted to be aphid-proof" to allow the propagation of "virus-free" grasses.